Here in Normandy remembrance is a part of life, a tradition that shapes the region’s institutions and inhabitants. Today’s commemoration ceremonies, organized by the Canadian Battlefields Foundation, allowed us to contribute to and better understand that tradition. The day began with a visit to the Mémorial de Caen museum that presents the history of the Second World War. We attended a luncheon there for the foundation’s supporters and were fortunate to meet all of them – in the process learning more about French culture as we adopted their way of greeting each other with a kiss on each cheek. I sat with a city counselor from Caen, who explained that his responsibilities in municipal government include acting as the Counselor for Commemoration. That they have this as a separate position is telling of how important they consider remembrance to be. Memorial at the Abbaye d’Ardenne. 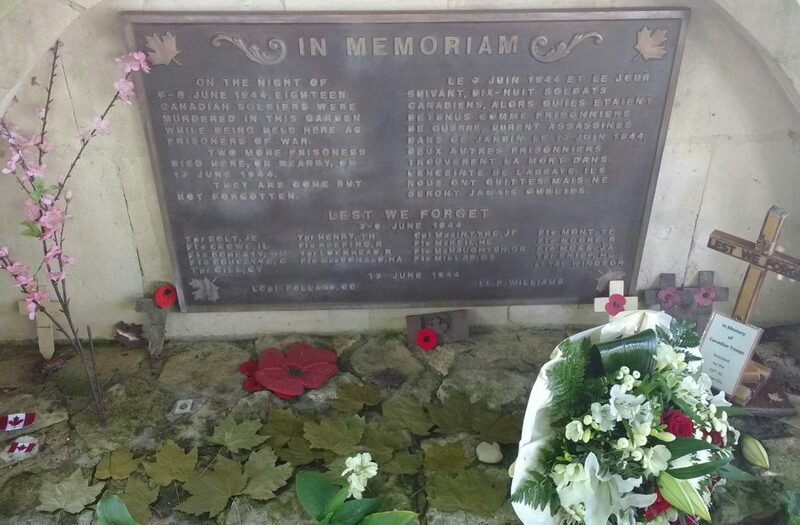 Each maple leaf commemorates a murdered Canadian POW. We moved into the Canadian Garden for the day’s first ceremony and joined the crowd of French citizens who would go on to attend all of the day’s commemorations with us. One lady said she had been attending the foundation’s events for years, and after the French anthem had been played she sang the Canadian one with just as much enthusiasm. In fact, to my surprise, everyone there knew the words to the Canadian anthem. It was yet another sign of the immense respect they have for the Canadians who liberated them. After a second ceremony, this time at La Place de l’Ancienne Boucherie in Caen, we proceeded to the Abbaye d’Ardenne for our third (and last) ceremony. Twenty Canadian prisoners of war were murdered there by the 12th SS Panzer Division. In a very moving act of remembrance, we laid one maple leaf for each soldier on the memorial. It was difficult to reconcile the brutality of their deaths with the peaceful garden we were in – sunlight streamed through the trees and songbirds accompanied the Last Post. Afterwards I spoke with several Frenchmen who remembered being liberated as children by Canadians. Attending these ceremonies was a way for them to continue to give thanks. The Norman warmth and hospitality that we have experienced these past few days was on display yet again when we were invited to a reception hosted by the widow of Jacques Vico, who used to live at the Abbaye. It was humbling to see the care with which a gratitude spanning 70 years has been, and continues to be, so profoundly and generously expressed. This year we started a new tradition of leaving our poppies at a tree. Yesterday, I had the once-in-a-lifetime opportunity to participate in the D-Day commemoration ceremonies at Bény-sur-Mer Cemetery, where I recited the Commitment to Remember. It was a powerful moment to make my promise among the graves of the Canadian fallen, and to hear it echoed by French and Canadians alike. As today’s commemorations showed, these are words for us to live by – and words that keep alive the memories of the fallen.